This remarkably accomplished prototype was developed in 1955 by W F Buckle, the Australian owner of a car distribution firm based in Sydney. Bill Buckle had at this time gained increasing influence over the business founded by his father, thus giving him the means to create the car in the company’s workshops. Buckle was also a well-known trials driver – so his credentials as someone who knew what a sports car should look like, and how it should drive, were not in doubt. The car had a fibreglass body and a removeable top in the same material. It was powered by a Ford Zephyr Six engine in standard tune, producing 68 bhp at 4,400 rpm – but Buckle had ambitions to equip the production version with twin S.U. carburettors, an 8 -to-1 compression ratio and a modified exhaust, to release 80 bhp. A small production volume was planned, making it easy, according to the rather optimistic pronouncements of the company, to offer as optional extras even greater power outputs, Laycock de Normanville overdrive to the three-speed standard gearbox, a high-ratio back axle and a bench seat instead of the standard two buckets. The one-piece bonnet tipped forward to reveal the engine, accessories, battery, heating system and, in an approach already used by Bristol in 1953 for their 404, the spare wheel mounted vertically between front wheel and bulkhead. Strangely for a right-hand-drive car, however, the tyre was mounted on the driver’s side, where changing a wheel would start with a severe risk of death for the driver – instead of the far more logical position on the nearside used by Bristol, and naturally vaunted by L J K Setright in “Bristol Cars and Engines”. Sadly, the production of this car was still-born. But it served as the basis for a further development: in 1957 the Buckle 2.5-litre coupé was launched. It still used Zephyr components, by that time from the Mk 2. 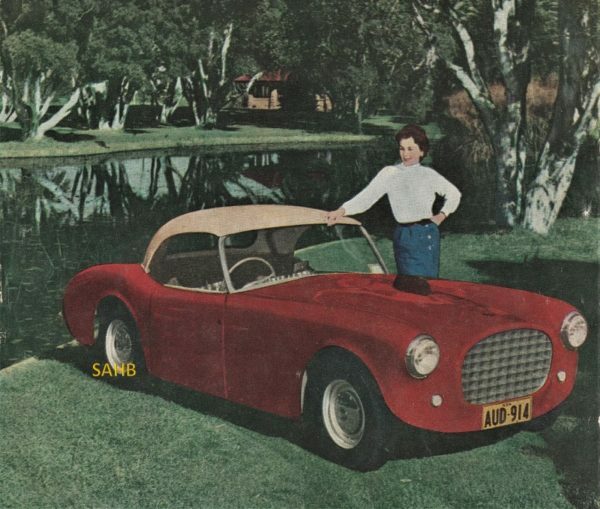 Despite a highly competent product, the project ended up in a loss and was stopped after production of only about 20 cars, as Buckle’s fibreglass work for the Australian production of Goggomobil cars built up.